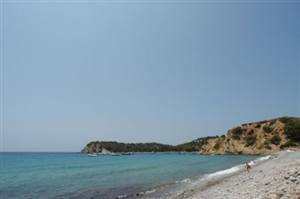 Cala Jondal is located between Sa Caleta and Es Torrent on the south side of the Island. This beach is ideal for family’s and a good place to go if you just want to relax. A selection of bars and restuarants serve the area and bar Alegria even plays chillout music to there area of the beach. If you really want to fully relax, there is also a massage hut that you can pay a visit to. There are no buses running to the beach, however there is a good amount of parking available. The beach itself is mainly covered in large pebbles and the sea is incredibly clear. It remains shallow for up to 30m from the shore but can be a little tricky to get into due to the large pebbles. Though there is a walkway at one end of the beach that makes life a little easier. Cala Jondal is also a popular spot for mooring and a favorite for many a yacht owner. During most days there is also a lifeguard on duty.